It seems as if the master bedroom is always the one room that gets the short end of the stick. Laundry gets thrown on the bed which then ends up piled on the floor after a long day or even longer week. Odds and ends find their way there waiting to be organized and most often mismatched furniture and bedding complete the room. The master bedroom is supposed to be a place that you retreat to every night. A place of comfort, relaxation and definitely not added stress from all of the random things in there. 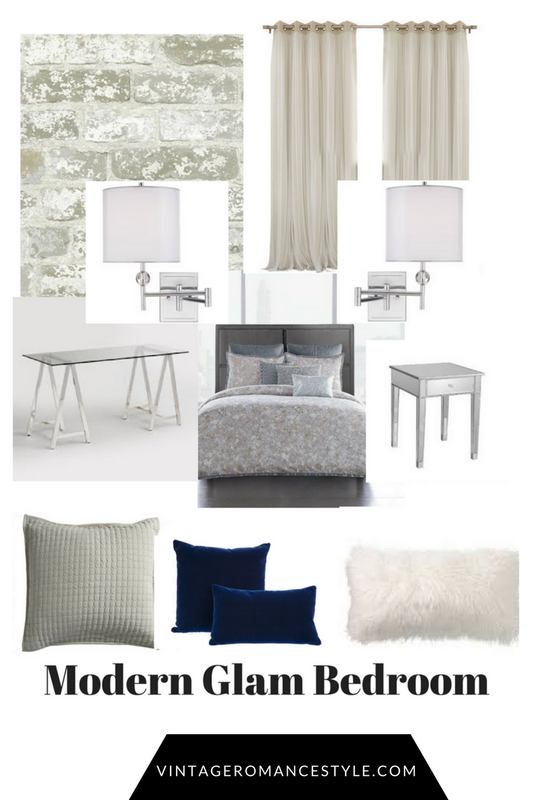 Putting together a pretty bedroom can seem daunting but actually it can be simple. With a little bit of money and time you can whip up a room that you love to walk into every night. 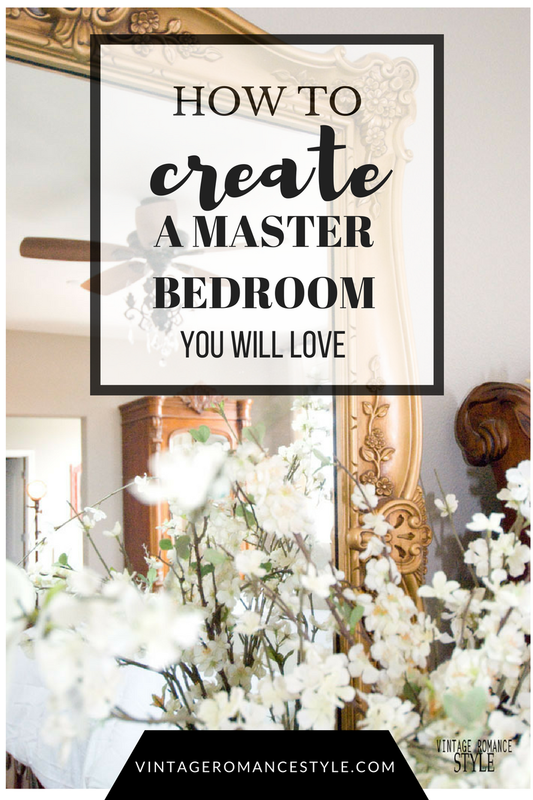 I'm going to break it down into simple steps to put together a master bedroom that you will love plus giving you updates on my own New Year New Room Master Bedroom Refresh. You can see week 1 HERE. 1. Figure out your style. There are so many to choose from and here are a few. Then there is boho, rustic, farmhouse, French country and more. Once you figure out what your true design style is or a mix of a few then you can move forward! I suggest you look at all different types of design styles on Pinterest to get a feel for what you really want. Search for master bedrooms and see what comes up. 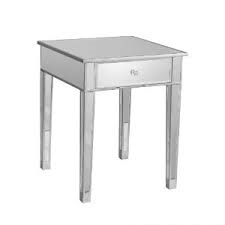 Do you like old looking furniture or sleek chrome pieces? Start asking yourself and write a list of things that you love and start with that! Once you figure out what style you love, pick out a couple of colors that you love. I like to stick with about 4 colors and can use one of them for a big pop of color. You also want your bedroom to flow with the feel of the rest of your home too as with any space. Style and looks are a big factor but what we don't often realize is that it may look beautiful but what may be beautiful isn't always functional. You need to choose furniture pieces that suites your NEEDS not just look pretty. So for me, a little bedroom office is crucial. It may not be look perfect in the room or in photos but it is a need for me so that's what I will go with. Also, my husband always needs a nightstand with some kind of storage. Bookcase or shelf is a need for me since my husband and I read a lot. I haven't found the perfect one yet so I'll keep searching! Also, a flat screen TV is always something in the bedroom for family movie night and Netflix when I can get some time to myself! Think about what are some key pieces that you NEED not just want. A bed, nightstand, maybe a small desk, dresser ect., then you can add in your stylish pieces like a bench, chair or even a little loveseat for creating a cute reading space. So far, I've chosen a new nightstand and desk and I absolutely love them! I will have to say that I did go outside of my usual box for my bedroom this time. I also chose this desk from World Market too! You can find it HERE. Whether it be a piece of art, rug or bedding, find something to base your entire room off of, including style and colors. This will make it much easier! You will need bedding, decorative pillows, lamps and accessories to complete your space. My favorite place to look for décor are Homegoods, Marshalls, Ross, and TJMAXX. Make sure to check out different locations of each store because they all have different things! 6. Don't forget your walls. Whether it be a fresh coat of paint or wallpaper, every room needs something to give it that extra WOW! One of the biggest changes you could ever make to any room is the walls! For my bedroom makeover, I chose to add some really fun but neutral wallpaper from Wallpaper Boulevard called Stucco from Urban Chic. 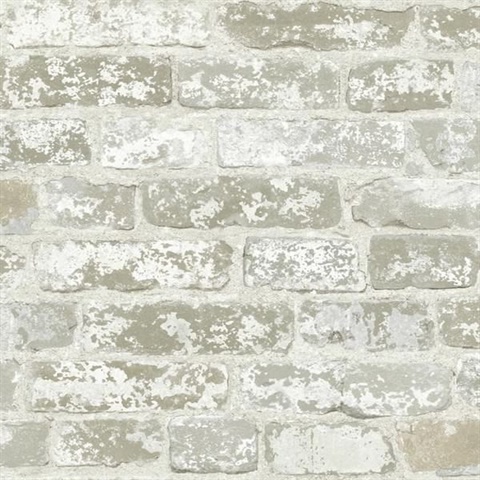 It is distressed brick with cream and grays but it also has a metallic sheen to it making it oh so glam! 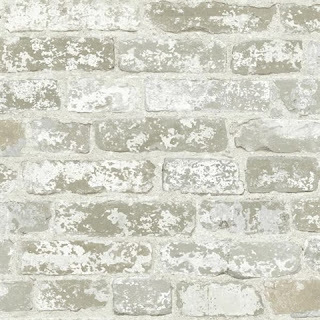 I have a thing for white brick! I chose this wallpaper so that it is able to match any colors and a few different design styles if I were to ever re-decorate in the future. That's the smart thing to do! Another way to really amp up the style is with lighting. I'm talking chandeliers all the way down to lamps and candles. One of my absolute favorite things in my bedroom is my ceiling fan chandelier from Lamps Plus that I installed myself! You can find my how to HERE. I transformed my boring ceiling fan into something pretty. Who knew that you could add a chandelier to your fan!? It is worth it! 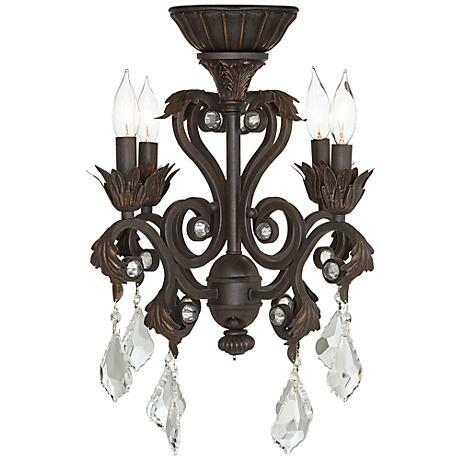 You can find my exact chandelier kit HERE. I'm still working on my bedroom day by day and I only have until the end of this month to complete it. I'll be drinking a lot of coffee, listening to music and getting to work! Now you can check out all the other ladies' progress on their New Year New Room Refresh! 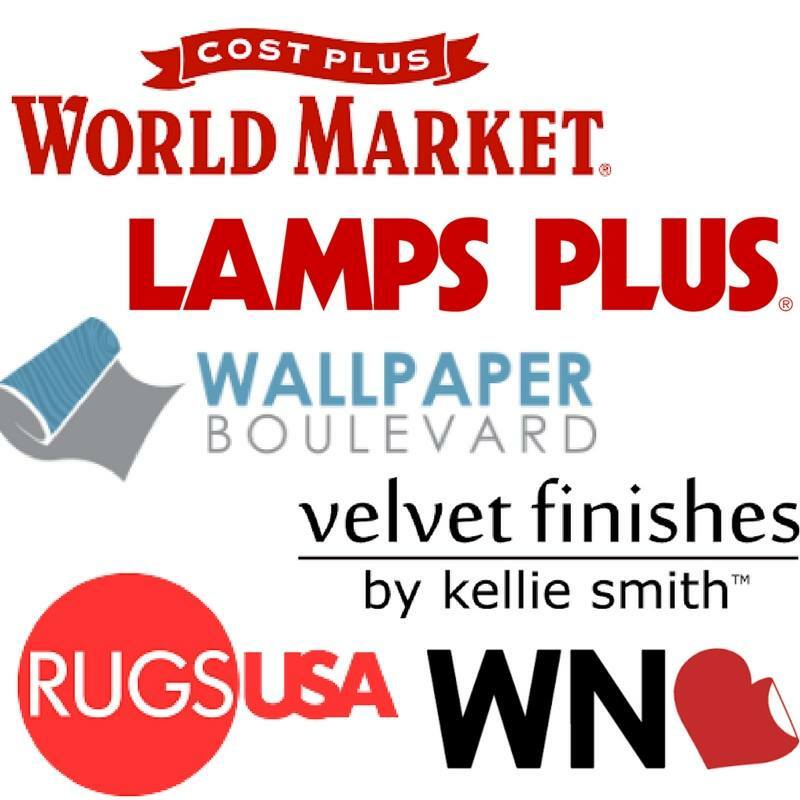 I also want to thank my amazing New Year New Room Refresh sponsors! Totally agree with you on lighting being key! Awesome tips Teryn. 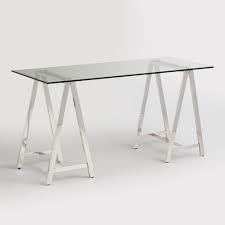 I definitely love that desk!!!!!! Great tips! The desk is gorgeous and I can't wait to see the finished bedroom. I love your tips and I am a huge fan of mirrored nightstands, too. They look great in any space. Such fab tips! I love a good glam nightstand!! Your room is coming together beautifully and I know everyone will appreciate some direction and great tips for creating a lovely bedroom of their own! This is one of the most helpful decorating posts I've ever read!